This is the perfect design for any dog lover! Spoil your four-legged friend a little and use this on all of your pet's accessories. This design is a dark purple with light purple accents. It is divided into two different patterns that have bones and pawprints on them arranged in different ways. The dividing line, which is closer to the top, is made of a lime green and white ribbon. 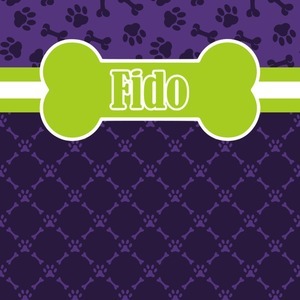 A label in the shape of a bone is on top with your pet's name right in the middle. The coordinating design has a fun sillhouette of a dog. Easily change the colors and other elements of this design to fit your dog's personality. Look through our patterns and graphics to find your dog's breed! Have fun creating your perfect design! If you ever need help using our design center, just give us a call! We are always happy to help.